I’m fascinated by the science of animal cognition. There is growing evidence that animals of all types may have emotions and can communicate their thoughts with each other, and with us. Pet owners report many experiences with this; so have people in the wild, witnessing dolphins, elephants, primates, etc. 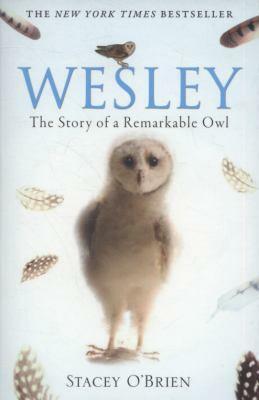 Wesley the Owl, written by former Caltech biologist Stacey O’Brien, explores animal intelligence, the deep emotional bonds that can exist between animals and humans, and other related subjects. If you’re interested in how and why animals communicate, check this book out. It’s a quick read, and your kids will probably love it, too. I finished the last page in the chair at my hairdresser’s, and, with foils piled high and tears streaming down my face, solemnly passed it along for her to read next. If animals really are sentient beings with thoughts and feelings, it’s time we stop treating them so inhumanely, especially those we mass produce and eat. I remember one of my aunts telling me that some spiritual people are so evolved they won’t eat anything with a face. Easy to remember, but hard to do! I’m not sure I have it in me to embrace a 100% vegan lifestyle–where do you draw the line? Do clams have faces? Can I wear vintage fur? Do I swat that mosquito away or smush it? Are petroleum-based synthetic shoes “better” than my Louboutins? Do you refuse to sit on a friend’s leather couch? Is eating a freshly-shucked oyster as inhumane as a bacon cheeseburger???? Still, as I get older, my desire to eat meat dwindles. Except for owl, of course. hi sweetie. I understand where you’re coming from, because I do this myself when I buy used / vintage fur coats. If the animal’s already dead (some for decades) then why waste it–especially when it’s freezing out? But…I do feel horrible about the way the agro-industrial complex or whatever you want to call it treats the animals and their related byproducts (dairy, eggs) that end up in our food chain. We’re absorbing that bad energy when we ingest it, and it’s also horribly polluting. Pig farms are just one notorious example; even methane produced by millions of cow farts is contributing to CO2 warming, if you can believe it! Look it up. except for owl. . . I see that Sicily has spiced up your humor. It’s a good thing that you weren’t vegan in Italy, or you would have only eaten carbs. Well, our family has been journeying back to veganism per our nearly-5-year-old Gavriel’s discovery that, yes, even the hormone-free chicken meat on his plate was, really, from an animal. “It’s sad that we kill the animals, right?” he’d asked half a year ago. The meat hasn’t been in the house now for a while, but we sometimes have eaten it at friends. We never ate red meat or chicken. Just fish. I could do that, no problem. I like to splurge on a $20 cheeseburger once or twice a year, but that’s enough for me. And homemade roast chicken in the winter is perfetto. PS – forgot to mention that this gluten intolerant friend often brings along a bag of rice pasta with him when we dine out in Italy. The kitchen cooks it right up, no drama/no questions asked! I love owls. They are a thing of grace, beauty and intelligence. I know what you mean, Monica! Stacey O’Brien mentioned those traits, and also describles how sensitive owls are, too. Just one example: They mate for life (unlike us humans!) and when their mate dies, owls can will themselves to die, and they do–even faster than they’d die from starvation or thirst. Thanks so much for this post! I want to read that book. Jonah would totally agree with not eating anything with a face. I know you’d eat a dog though if you had a chance. I agree what you say about the world being made up of hunters and hunted. I don’t want sharks or owls to go vegan, for example, I just want us humans to be a little more thoughtful about who and what we eat. We’re so disconnected from our food nowadays – unlike our ancestors, even those from just 1-2 generations back, who worked on a family farm, for example, and grew their own veggies and cared for the animals they ate. Now we just head to the nearest supermarket and pluck things off a refrigerated shelf. I don’t think I have it in me to give up meat entirely, I just want to make better choices about what ends up on my table. Btw I’m guessing that you love rodents but not in the culinary sense 😉 …I remember reading how Wesley would insist on feeding you a mouse every day and that you had to pretend to eat them. Ew. I don’t know how you managed that! I love owls so much. I’m thinking of getting an owl as my next tattoo. I struggle with the issue of going vegetarian or vegan all the time. I love animals so much but I feel like such a hypocrite saying that since I also eat meat. I try to buy humanely raised, local meat and poultry, eggs and dairy whenever possible, and eating fewer animal products than I used to (it’s healthier anyway), but I still feel bad. But I try to be mindful that these were living creatures. Yeah, I hear you, hon — It’s really tough not to eat meat. I rarely eat red meat, but when I do I really appreciate it. We’ve cut way down, too, any try to only eat humanely raised meat…but I wonder how we can really know for sure. Ugh. I keep thinking of those horrible meat processing videos whenever I eat it. And I agree, I think being mindful about what we put in our mouths is key. Mangia!